These mid-sized flying Heartless are able to spontaneously appear behind their targets and possess them. Though they behave similarly to Hover Ghosts, physical attacks won't stagger them. Remember, there's no shame in falling back to regroup. The Living Pod is an Emblem Heartless that is found in Kingdom Hearts 358/2 Days. A Living Pod is a humanoid creature clad in a white coat with black cuffs. 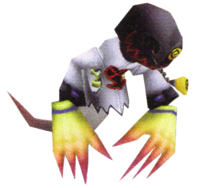 It wears pale yellow gloves with pink fingertips—causing them to resemble actual hands—on its large, long-fingered hands, which are not directly connected to the Heartless's body and can be "thrown" at enemies. A few holes in this coat expose the creature's ribcage. Its Heartless emblem is printed on the front of its coat. The Living Pod's black, spherical head sports a jagged, red mouth and two yellow eyes with black spirals in them. Its right eye hangs down from its socket, attached to its head by a silver chain. It can generate spotlights from its eyes, suggesting that they may be mechanical in some fashion. The Living Pod's lower body is a simple, white, ghostly tail with a faded red tip. The "Living Dead" and the "Pod People" are both well-known zombie-like monsters from film history. The Living Pod's name combines these, highlighting its undead nature. These Heartless only appear in one mission at Beast's Castle, in which Roxas has to break jars. They randomly appear when the jars are broken, so it's possible to go through most of the mission without seeing one. However, when they do appear, they are quite dangerous. Their possession attack will remove a full bar of life from Roxas, as they have much more strength than normal enemies. The best solution is to simply get to the other end of the hall when they appear, which will hopefully keep them from spotting Roxas. He can then go back and try to break the remaining jars with a quick combo. However, if they fade out while near Roxas, they are about to use their possess attack, so it's advised to run before they can strike. If it is necessary to fight them, use Aero spells to knock them into the air, and then Fire spells to inflict massive damage. Another good way is to attack from behind them without noticing Roxas. It will indicate that it sees him when it waves its hands in the air and the light from their eyes become orange. It's possible to defeat them without them noticing. This page was last edited on 3 May 2018, at 14:47.